Is it safe to use Q-tips to clean my ears? Posted July 28, 2017 under Ask Us. 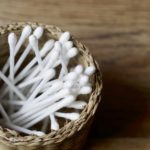 The American Academy of Otolaryngologists (doctors who specialize in conditions of the eyes, ears, nose and throat) say that: cotton tipped swabs such as “Q-tips” should NEVER be used to clean the ear canal. In fact, swabs can actually push ear wax further into the ear canal, causing a temporary hearing loss due to wax (cerumen) build-up deep in the ear canal. Earwax is normal, healthy, and naturally protects the inner ear from dust and dirt particles. The safest way to clean the outer ear is to use a facecloth. Sometimes earwax can build up and cause a feeling of fullness in the ears, partial hearing loss, and/or tinnitus (ringing in the ear). If you have any of these symptoms, talk to your health care provider. Your provider may tell you to use a special over-the-counter ear wax removal medicine or he/she may need to remove the earwax in the office.